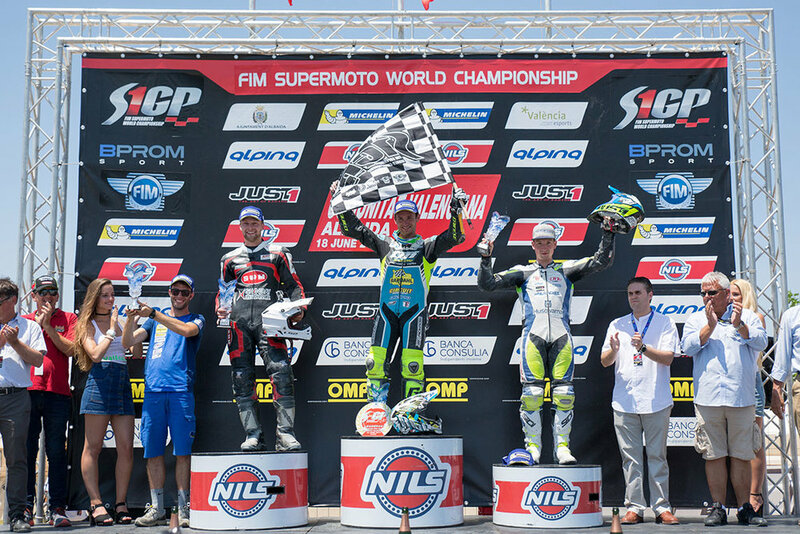 Thomas Chareyre (TM) won the FIM S1GP SuperMoto World Championship for the sixth time in 2017, coming out on top of the two-round, six-race series after a strong challenge from German pair Markus Class (Husqvarna) and Marc-Reiner Schmidt (SWM). Chareyre, champion for the past three seasons as well as in 2010 and 2012, knew that he was in for a battle from the first race in Albaida, Spain, when he got the holeshot and set a string of laps faster than his qualification times yet still couldn't shake Class. With Italy's Diego Monticelli (TM) at the front of the chasing pack and comfortable in third, it was a disappointing start to the season for Schmidt as he got passed for fourth in the latter stages by the Austrian Lukas Hoellbacher (Husqvarna), making his first appearance of the year. Hoellbacher was then second to Chareyre in race 2, with Class and Schmidt in third and fourth respectively, although with the new FIM rules for 2017 where the front three rows were reversed for race 3 it resulted in polesetter Chareyre having to start from ninth position. The defending World champion moved up seven places in two laps but Schmidt didn't put a wheel wrong at the front to secure the first victory for SWM in the World Championship. Class and Schmidt were thirteen and fourteen points respectively behind the Frenchman going into the second and final round in Chachagui, Colombia, but after each taking a second place to him in the opening two races, the championship was virtually decided. This time even the reverse grid could not stop the brilliant Chareyre, who signed off with a third win from three to put the shine on a sixth title. 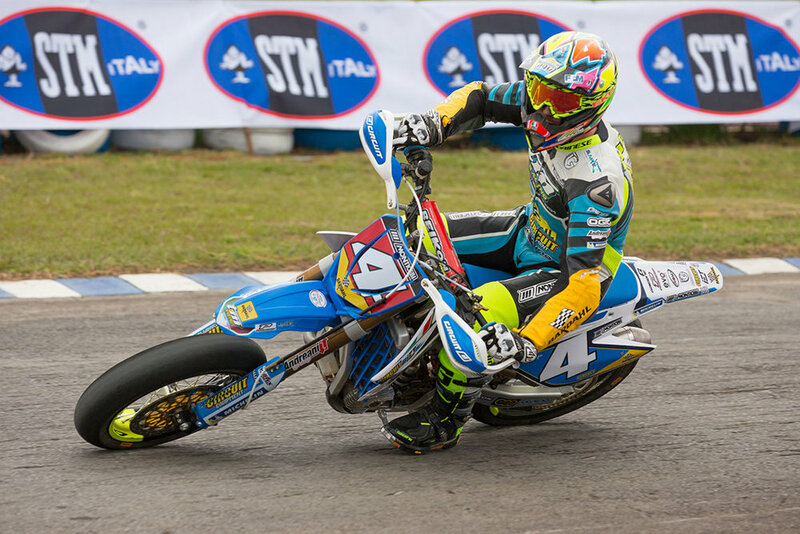 Thomas Chareyre (TM) won the FIM S1GP SuperMoto World Championship for the fifth time in 2016 but he was pushed all the way for the title, with Germany's Marc-Reiner Schmidt (TM) taking the fight to the final race of the season in Castelletto di Branduzzo, Italy. Chareyre, already the champion in 2010, 2012, 2014 and 2015, made the ideal start to the season with double race victories in the opening two rounds at Jerez and the new Albaida track in Valencia. However, 19-year-old Schmidt, who made the step up to S1GP this season, broke the Frenchman's stranglehold on the series at the third round in Busca, Italy, with a victory in the first race ahead of Pavel Kejmar (KTM) of the Czech Republic. Schmidt stormed to his first overall win at the next round in Poznan with a combined second place in race one and victory in the second race. However, Chareyre remained in control of the championship and added another double and the overall win at the next round in Austria. Schmidt again took the overall win at the final round but could do nothing to prevent Chareyre picking up second place in the second race, sealing the 22 points he needed to make sure of the title. A double podium for Kejmar wrapped up third in the championship.